This is the 8th post in this NaNoRenO 2016 series. If you guys are wondering why I'm suddenly posting one review a day, well... haha, for one, these are actually scheduled posts, which I made when I was on vacation in the countryside, and two, I just want to get this NaNoRenO series over with because I still have a bunch of long-overdue reviews to post. Hahahaha. Anyway... moving on! It’s a regular boring day, and craftsman Van is worrying that he might not get through another day. There’s rent to pay, items to forge, food to buy, but his finances have long been running out. He came to the town of Azalea in order to earn more money and achieve his dream of becoming a master weapons craftsman, but so far, all he’s been receiving are orders for cheap jewelry and kitchenware, like… errr, frying pans. 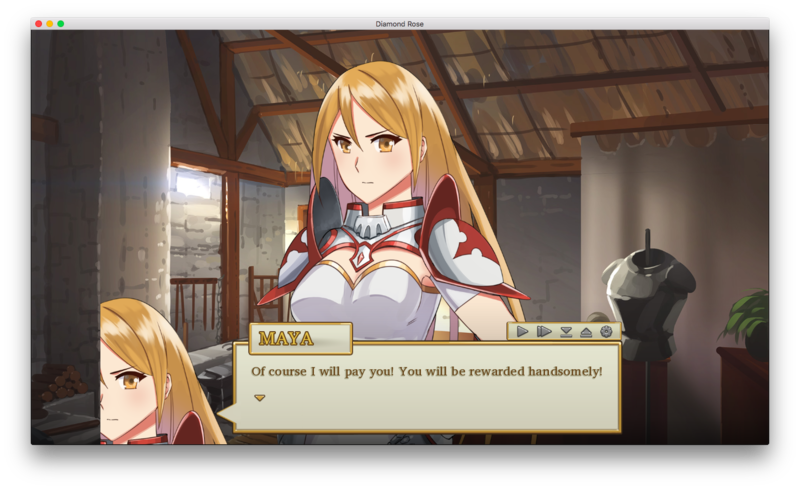 As if on cue, a swordswoman from the guild Diamond Rose, Maya, suddenly comes by his shop and asks him to create a weapon for her. However, their adventure together just might be more than he signed up for. The premise is really simple. 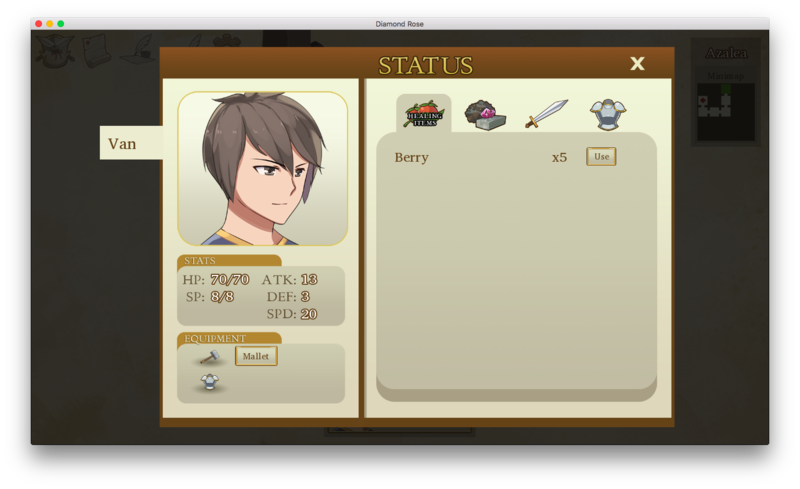 Our protagonist, Van, is all out of resources and he needs money, badly. That's why he accepts the work of a young swordswoman who asked him for help, after giving him a series of compliments regarding his work. To be honest, there's very little screentime for the characters here, because majority of the time, you'll be out in the open fighting monsters. However, I think the plot is quite interesting, despite the fact that it's very short. I sure would love to see a longer version of this, though! He’s the protagonist of this story. Unlike most other male protagonists, he’s actually able to resist the “charm” of the beautiful women in this story, even going as far as (almost) kicking them out of his shop when they are unable to pay. I actually like his no-nonsense, all-business attitude. She’s the kind swordswoman who first asked Van to create a sword for her. The first time they met, she wasn’t able to uphold her promise of paying Van back within an hour, which caused him to pack his bags, having no choice but to leave after he had been “swindled”. Maya turns out to be quite a sweetheart, however, and she did come back, albeit three hours late. 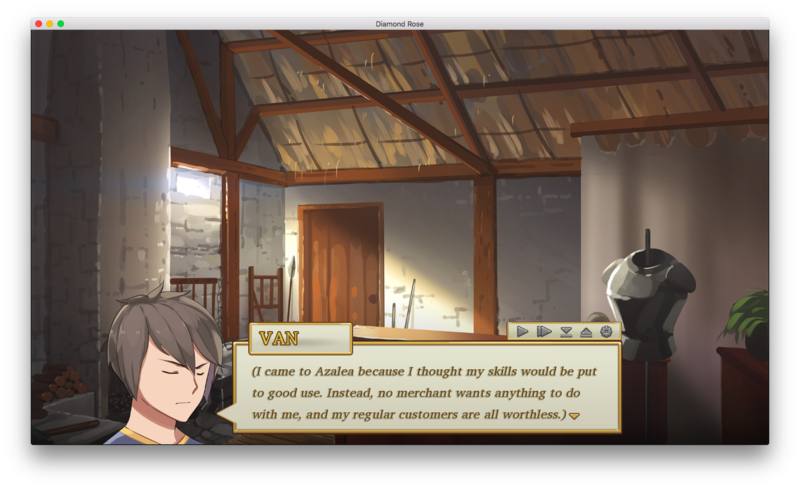 Surprisingly, she shows affection for Van rather early in the story, even sticking up for him when her teammate expresses doubts regarding his skill. Maya’s stoic and serious teammate, who’s skilled with the bow and arrow. In contrast to Maya’s extremely trusting and open nature, Aria tends to be more suspicious about the world around her, refusing to believe without considerable proof. While she tends to be blunt and crass most of the time, giving out compliments is a whole other story for her. 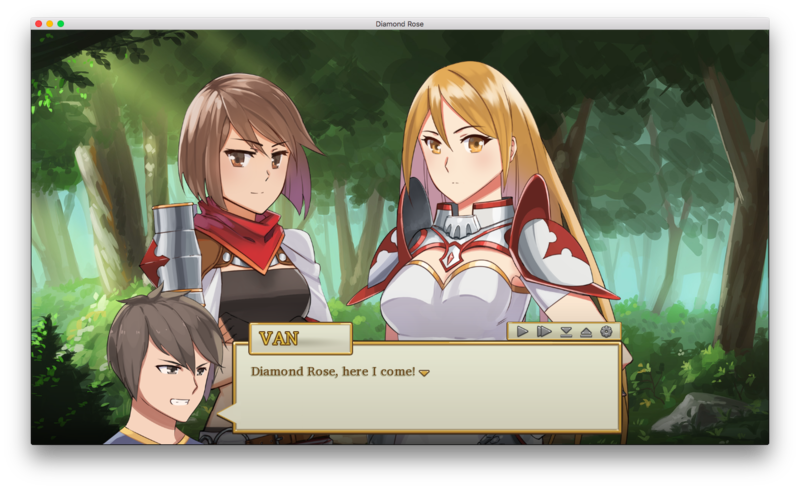 Near the end of the game, she did learn to trust Van, enough to actually invite him to join them in Diamond Rose. No typos or spelling mistakes… like, at all. Maybe I just didn’t notice, since I was way too engrossed in the game, or maybe it’s only natural, since there isn’t much text in this visual novel anyway. Still, I’m impressed. The dialogues also flowed really well, and it didn’t seem to me like the blooming friendship/relationship between the characters were forced at all. Hooray for that! One little thing that I kinda got tired of though was the constant use of, “…okay, I’m leaving, bye…” reaction from Van. I think he used that more than 5 times in the course of the visual novel! Considering that this is really short, text-wise, it was a bit too… excessive for me. Seriously, stop making the same “joke” over and over again, Van! It’s your standard anime-style art. It’s beautiful, sure, but I do find the style to be quite… common, perhaps? There are no outstanding qualities whatsoever that sets it apart from the other visual novels. If you take out the characters from the game, I could easily mistake them to be from some other game, judging from the art style alone. 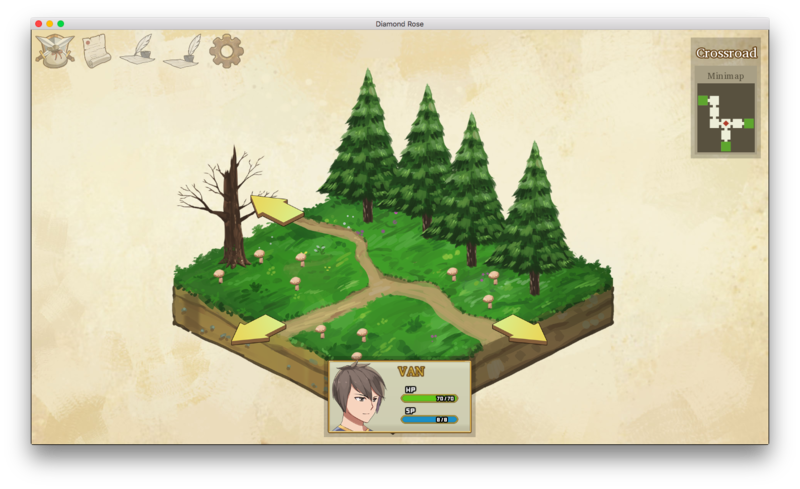 The backgrounds are beautiful, both in the visual novel part and the RPG part. I just love the soft coloring style, in contrast to the darkly lined sprites. There’s one thing I’d like to commend, and this may be a really, really small thing, but I adore Van’s “thoughtful” look. I mean, just look at it (look at the Aria screenshot). So full of emotions underneath that look. I don’t usually notice these things, but it’s one of the most expressive expressions I’ve ever seen in a visual novel sprite so far. Okay, I take back the “no outstanding qualities” for me. That kind of look, surely stands out for me. 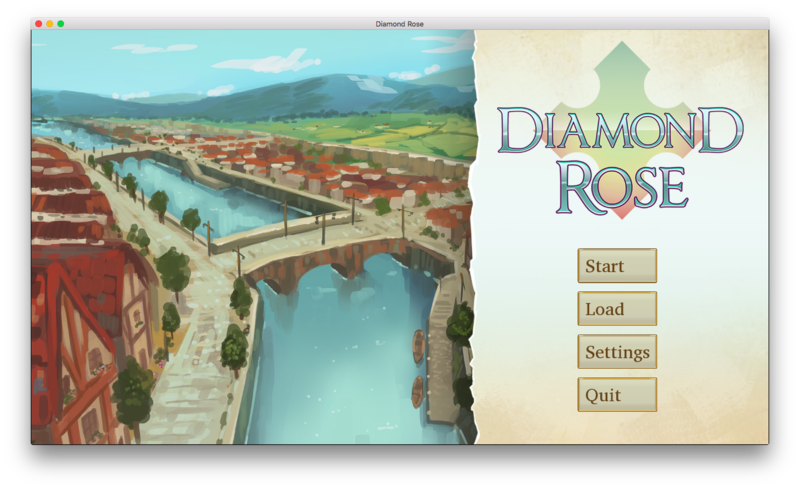 This is not a common occurrence here, I know… as a matter of fact, this is the first time I’m going to add gameplay in one of my reviews, but Diamond Rose is an exception because it does contain RPG elements. You can have random monster encounters here, you can have boss battles, you can even forge weapons and armor for your party! I especially love the latter part, since that has always been one of my favorite parts in RPG games. In battles, you have the option to choose  Fight, which is just to fight with the bare stats you have,  Skill, which uses up SP,  Item, which allows you to use an item, and  Def, which momentarily increases your defense against attacks. I’m sad to see that there’s no option to run, as it’s not fun to get bombarded by monsters when you’re already low on HP and SP, which always happens to me. Also, the characters don’t have levels here, so fighting the monsters don’t reward you with EXP, which, in other games, could increase HP and SP—not to mention, it could also increase the player’s motivation to actually defeat the said monsters. I’m not sure why it wasn’t included; maybe it was due to the more complex programming, or perhaps it was beneficial to the story in some way. Perhaps the developers didn’t want us to become over-leveled. Nevertheless, the inclusion of EXP would’ve been nice. 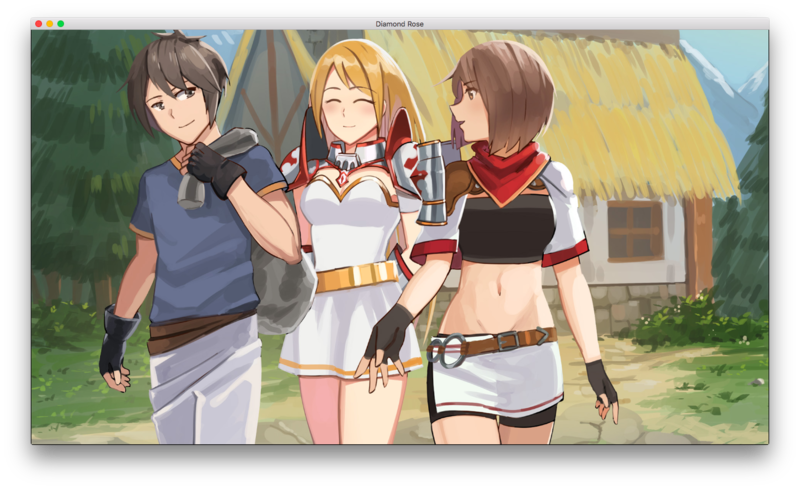 A little tip for the RPG part of the VN! It can be a little hard, and I have to admit that my party died a few times, (thank goodness for saves!) so always remember to stock up on items! You don’t have to use them sparingly, too. If you exit the forest and re-enter it, you’ll see that the items will all be magically replenished. Hooray! Also, you can always go back to your house and rest up. 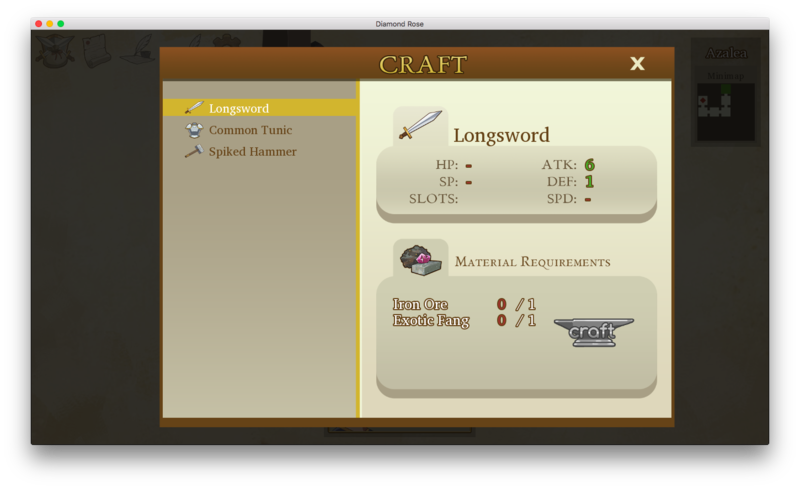 Or better yet, you can forge new items to increase your HP and SP! Like I said, that was my favorite part. It was super fun. Simple, but I liked it. It really matched the minimalistic feel of the entire VN. Still, it was done really well. It even has customized buttons on the textbox! Weee, my beloved auto-read button is here! Aria's left side! What happened?! I’m… slightly ashamed to say this, but I wasn’t able to notice the music very much while I was playing. However, I did listen a bit after I had finished the game, and it was okay. I didn’t really hear any fade-ins, fade-outs, so I therefore conclude that the looping was good enough. Hahaha. 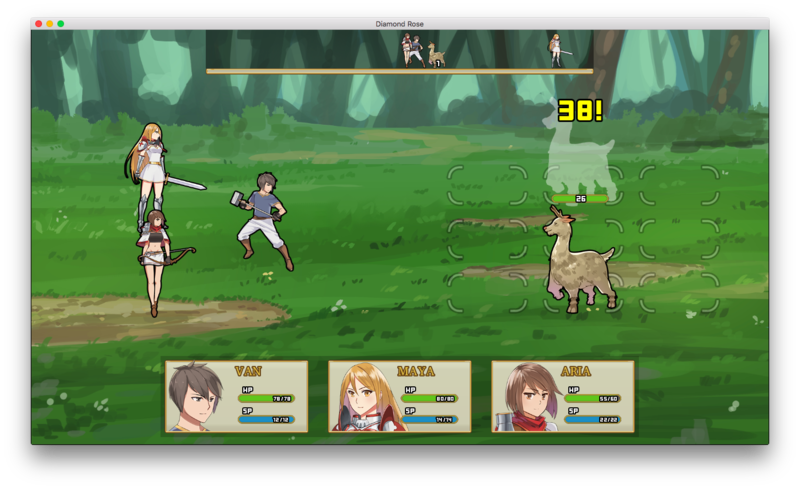 There are plenty of sound effects included here too, since well, RPGs do have sound effects in the random battles. 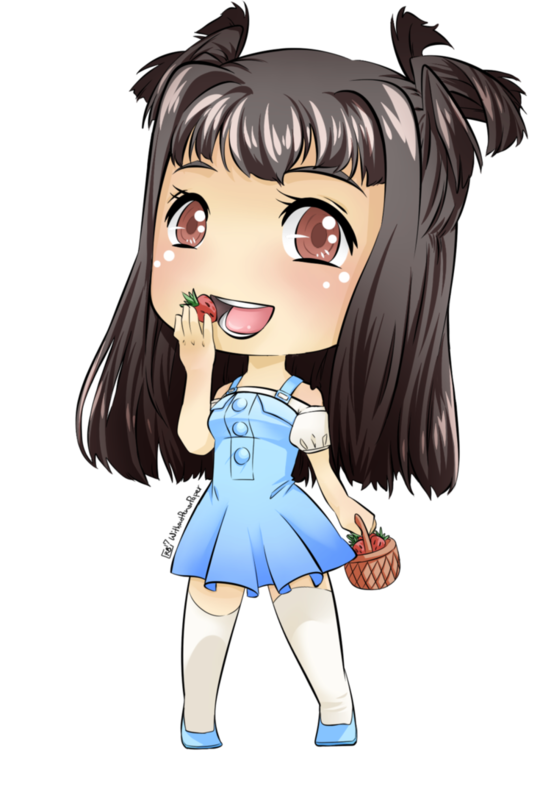 I’m happy to present this with nine strawberries on top! 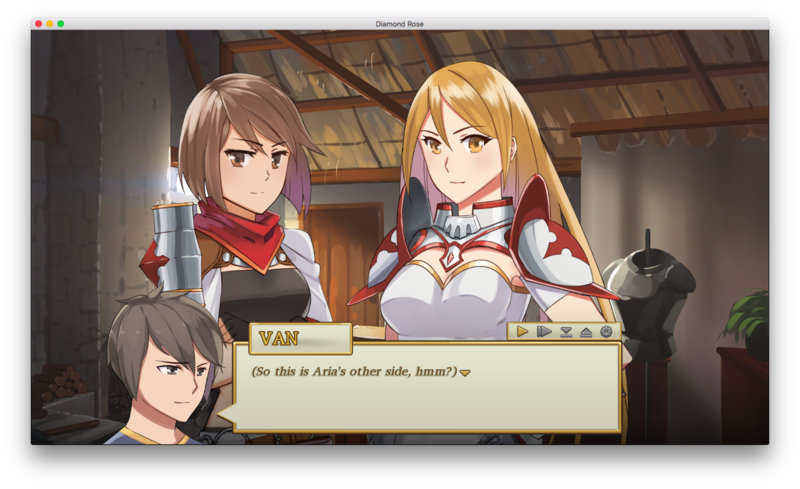 Aside from the very minor gripes I’ve mentioned above, it’s a very well-made visual novel, which has a unique offering that not many visual novels have. And even though it’s kinetic, I can say that I definitely enjoyed playing this. In fact, I enjoyed it so much that it left me wanting for more. More! More! More! I really hope to see an expansion to this game. Maybe we can finally get to see Van settle down in the guild? Oh, that would be awesome! 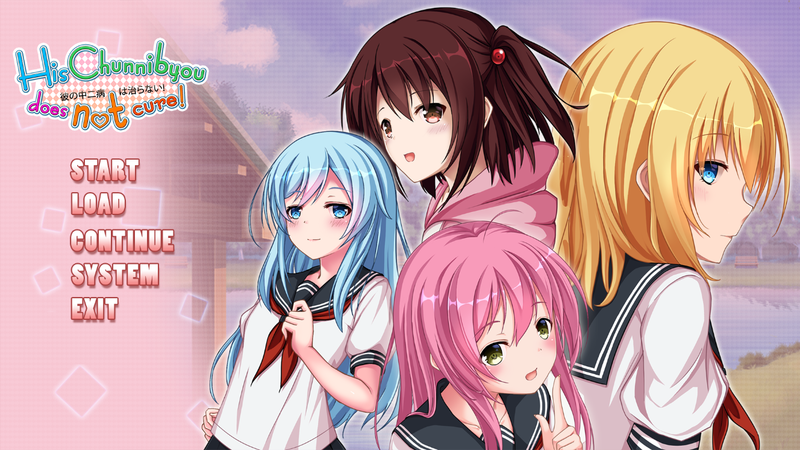 You can download this visual novel here. P.S. If you enjoyed this game, you might want to check out Nanolife by Circle Pegasi, which also has similar gameplay elements.